The good folks over at Nokia recently sent me my first smart phone (I have an iPod Touch, not its fancier sibling) in the form of a Nokia N8. Serendipitously, Ria Lu of Talecraft just finished creating an app for the Nokia Ovi store. 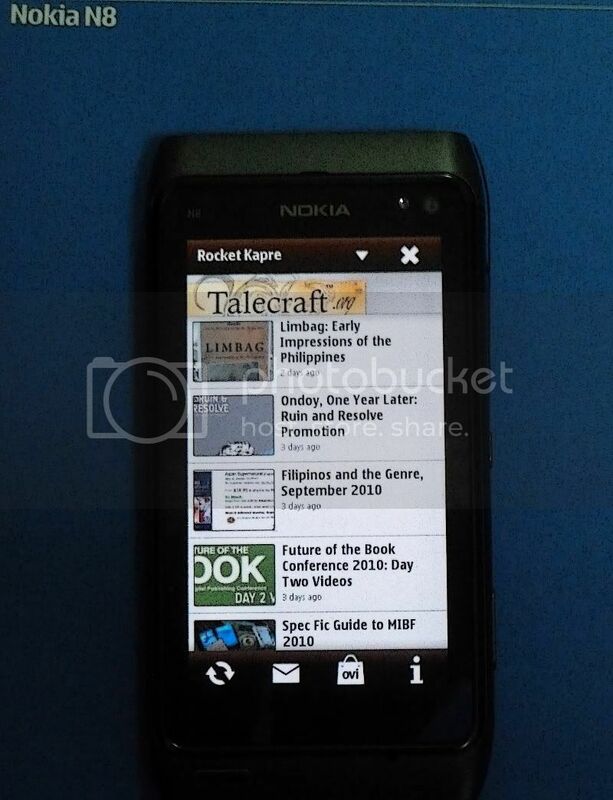 The Talecraft App is a free application for Nokia phones which aims to be a resource for writers, serving as an RSS Feed/hub for Talecraft content, as well as Kenneth Yu’s Philippine Genre Stories blog, as well as Rocket Kapre. If you have access to the Ovi store, give it a go! Many thanks to Ria for adding Rocket Kapre access to the app. I’m something of a late adopter when it comes to telecommunication tech (as opposed to, say, video game consoles), and I’m interested to see if having mobile access will change my relation to the social networks. What I’m really looking forward to, however, are attempts by Filipinos to use apps as a means to distribute stories, and maybe additional content. Transmedia development anyone?